First we have this lovely pair of Antique Oil Paintings of Fishing Boats by J J Wilson dating from the 19th Century. Either one of these would have been a great addition to the collection of any lover of boats and coastal scenes but to find a pair like this must be an even more treasured find for their new owner. Painted by John James Wilson, an English artist who was born in London in 1818 and exhibited regularly at the Royal Academy Of Art. His themes were mainly of a coastal or marine nature and it is no surprise that, despite being a Londoner by birth, Wilson died in that most quintessentially English coastal town, Folkestone. Both of these oils were framed but the canvases themselves measured 25cm x 44cm. Wilson’s work regularly fetches good prices in art auctions and the new owner of this pair of fine oil paintings has acquired something of great visual appeal and, an investment for the future as well. This pair of Antique Oil Paintings of Coastal Scenes is by another artist active in the 19th Century, W A Wall. William Archibald Wall was an American artist, born in New York in 1828. Details of his death are unclear but it is believed to have been in 1878. He specialised in Waterscapes, landscapes and urban views. Although an American by birth, Wall spent many years living and working in London. These paintings were both mounted in ornate frames but the canvases themselves measure 19cm x 34cm. 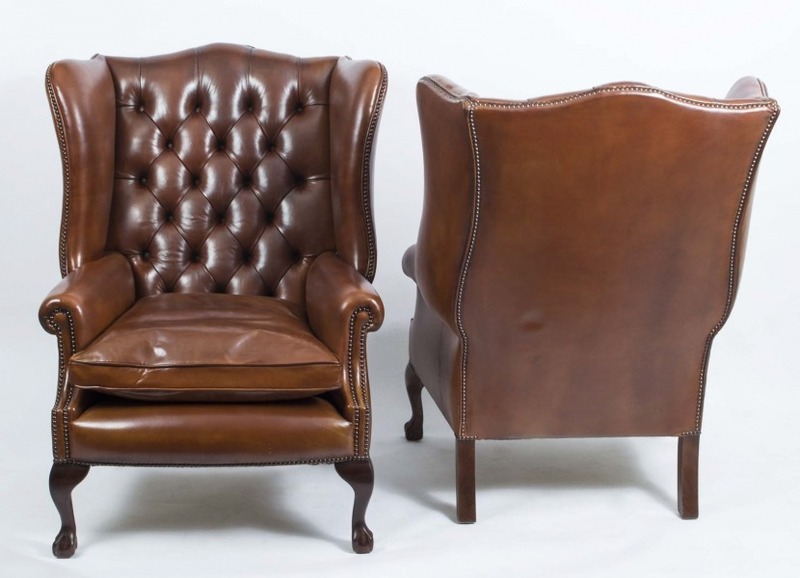 Still sticking with pairs, we are moving now to look at pairs of chairs and the first pair we want to show you is this pair of new leather wing chairs with Chippendale-style ball and claw legs and very attractive and comfortable sumptuous leather upholstery. These chairs are hand-made in our own workshops by experienced craftsmen and, if you would like a pair, can be ordered with the hand-dyed upholstery in any (almost) colour you like. These chairs measure 112cm in height and 84cm wide. They are 94cm deep. As you can see, their new owner has acquired a fine pair of chairs that not only look good but which are very comfortable with their tan leather drop-in seats. 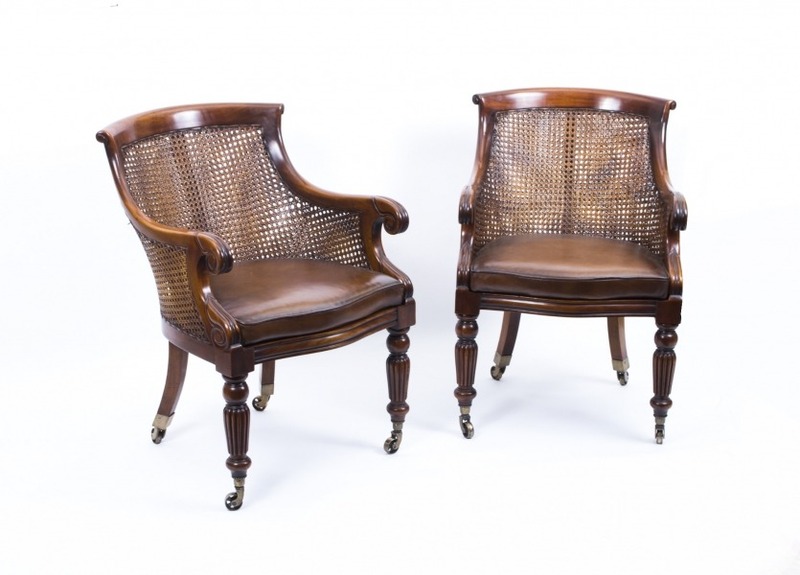 These chairs were in excellent condition and can be dated from the latter half of the 20th Century. They are made of solid flame mahogany and feature scrolled arm terminals. The chairs have reeded legs which terminate with brass cappings and castors and splayed square section back legs also terminating in square cup brass castors. The chair seats and backs are double caned and we are pleased to confirm that the cane is in excellent condition. These chairs each measure 93cm high x 62cm Wide x 74cm deep. This is a fine pair of tables in excellent condition and dating from the latter half of the 20th centrury. 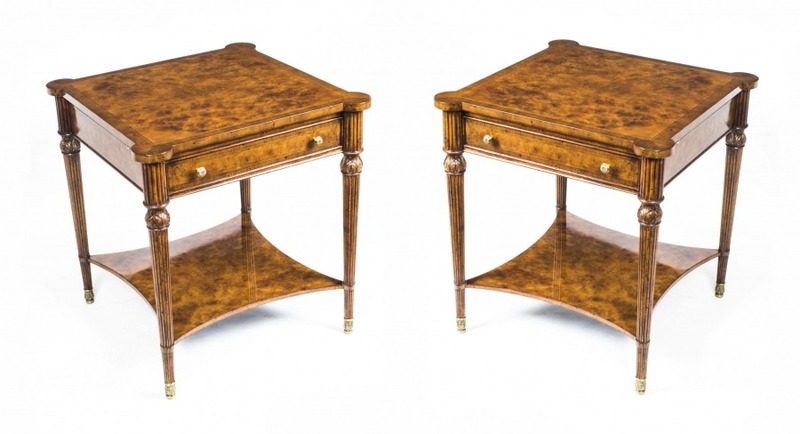 They are fashioned from that most striking of materials, burr walnut, and are actually designated as side tables fitted with drawers and slides. The burr walnut has been crossbanded with plain walnut and finished with satinwood inlaid decoration. The drawers are lined with oak and each has a pair of useful slides and is fitted with a shelf below. The tables each measure 65cm in height x 61cm wide and 61cm deep. Be sure to check the website to see many more items that have not yet been sold – who knows, you may find something you will want to own and treasure – please check back soon for our next round up of recently sold items at Regent Antiques.